The 1821 Edwards Catalogue by G.E. Bentley, Jr.
H.T. Dickinson, ed., The Political Works of Thomas Spence, reviewed by G.E. Bentley, Jr.
G.E. BENTLEY, JR. of Wai Wen Xi, Fudan Daxue, Shanghai, and University College, University of Toronto is currently concerned with The Great Illustrated-Book Publishers of the 1790s and with Poems Recently Attributed to William Blake. MARTIN BUTLIN is Keeper of the Historic British Collection at the Tate Gallery, London, author of numerous books on Blake and Turner, and frequent contributor to Blake. V.A. DE LUCA is Professor of English at Erindale College, University of Toronto. ROBERT N. ESSICK (Professor of English, University of California, Riverside) is currently writing a catalogue of the Blake collection at the Huntington Library to be published by the Huntington in 1985. NELSON HILTON is Blake’s review editor. ANNE MAHEUX is presently assistant conservator of graphic arts in the Restoration Conservation Laboratory, National Gallery of Canada, Ottawa. She received her Masters in Art Conservation at Queen’s University, Kingston, Ontario in 1981 and served an internship in paper conservation at the Center for Conservation and Technical Studies, Fogg Art Museum, Harvard University in 1981-82, where the research on Blake’s watercolor pigments was carried out. PAUL MANN is a Mellon Post-Doctoral Instructor at the California Institute of Technology. JUDITH OTT, Art History Instructor at a small New England College, has contributed to Blake in the past. At present she is putting the finishing touches on her Ph.D. dissertation of seven years research at The Ohio State University on the artistic sources for all 100 of the plates of Jerusalem. JOAN KOSTER STEMMLER is a Ph.D. candidate in the Department of the History of Art of the University of Pennsylvania and is a lecturer at the Philadelphia College of Art. Editors: Morris Eaves, Univ. of New Mexico, and Morton D. Paley, Univ. of Calif., Berkeley. Production Office: Morris Eaves, Department of English, University of New Mexico, Albuquerque NM 87131, Telephone 505 / 277-3103. Editorial Assistants in charge: Marcy Erickson. Editorial Assistants: Leslie Donovan, Robin Tawney, Chapel Petty, Univ. of New Mexico. Blake / An Illustrated Quarterly is published under the sponsorship of the Department of English, University of New Mexico. Subscriptions are $18.00 for 1 year, 1 volume (4 issues) for institutions. Special rates for individuals, $15.00 for 1 year, 1 volume (4 issues[e]). For all foreign addresses we required $3.00 postal surcharge unless subscriber requests airmail delivery which requires a $10.00 postal surcharge. U.S. currency or international money order if possible. Make checks payable to Blake / An Illustrated Quarterly. Address all subscription orders and related communications to Marcy Erickson, Blake, Dept. of English, Univ. of New Mexico, Albuquerque, N.M. 87131, USA. Manuscripts are welcome. Send two copies, typed and documented according to the forms suggested in the MLA Style Sheet, 2nd. ed., to either of the editors: Morris Eaves, Dept. of English, Univ. of New Mexico, Albuquerque, NM 87131; Morton D. Paley, Dept. of English, Univ. of California, Berkeley, CA 94720.
International Serial Number is 0006-453x. 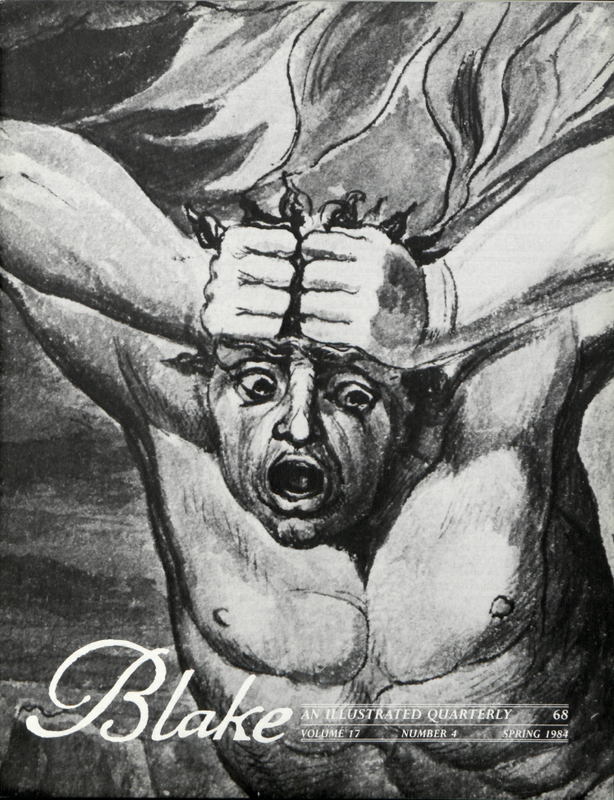 Blake / An Illustrated Quarterly is indexed in the Modern Language Association’s International Bibliography, the Modern Humanities Research Association’s Annual Bibliography of English Language and Literature, English Language Notes’ annual Romantic Bibliography, ART bibliographies MODERN, American Humanities Index, and the Arts and Humanities Citation Index.